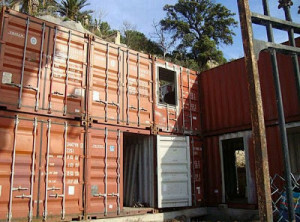 Container homes are popping up worldwide. Today we’ll explore homes in Chile, France and Canada. I have one picture of each house to start and then plenty more below. 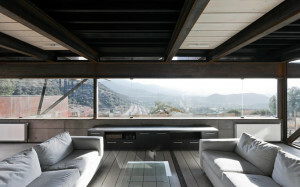 creating air circulation, sunlight and open and private spaces throughout the home. You really need to click on this link to see a ton of pictures of this beautiful home. 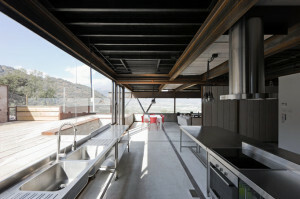 It has a very clean, industrial look that takes advantage of the gorgeous views around it. The pictures are copyrighted by Sergio Perrione. Next up is a French home built right on the Mediterranean Sea. French architects Claire Helene Drouin and Jean Marie Sanchez designed their home out of 15 containers and blogged about every step of the way. If you can read French, there is plenty of information on every step from preparing the mountain-cliff location to placing the containers onsite. 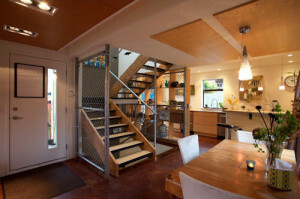 And last but not least, Canadian residential designer Keith Dewey created his own home out of 8-20’ containers. It has an open main floor and spacious bedrooms. For more pictures, click here! While browsing the pictures, if you want to see one larger, just click on it. If you are considering building a container home, please tell us what other information you would like us to cover in our blog posts so we can make sure we’re being as helpful as possible.